You've probably seen Actresses without Teeth. Or Celebrities Without Eyebrows. Or Small Face Celebrities. Now, There's Pin the Face on the Celeb. Lovely. On 2ch, Japan's largest internet forum, a net user uploaded a series of "Pin the Face" style images of celebrities. Like the game Pin the Tail on the Donkey, physical features are being moved about. However, this isn't a game per se. And nobody is blindfolded. It's internet hijinks. Here's the first celeb: Atsuko Maeda. In case you are not familiar with Atsuko Maeda, she is a pop singer and actress. She used to be a member of AKB48, which is a popular Japanese idol group. And here's how her mug was rearranged. The second is Ayame Gouriki, who is an actress and model. She also voiced the character Maria in 3DS game Rhythm Thief & the Emperor’s Treasure. And here are her features moved about. There isn't any evidence of this becoming a meme yet in Japan—though, Japanese people on Twitter seem thoroughly amused. What might keep it from exploding meme wise is long "Pin The Face" images must take. 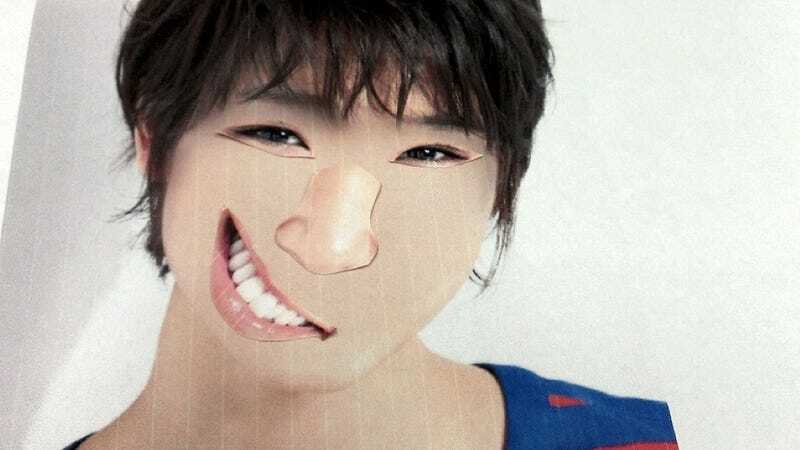 Apparently, the 2ch user who created these images first erased each celeb's facial features. Then he or she cut out each celeb's features from another print-out. And finally, after printing out the blank face, he or she arranged the features in various manners, taking photos of each version. An afternoon well spent. I guess! "Even though they're the person's same features, they look like a totally different person depending on where you arrange them," the 2ch user wrote. The whole thing sounds...rather time-consuming! But, at the same time, it's somewhat charming to see something somewhat analog (scissors? cutting?) in our very digital age. Charming and, as some of these photos show, nightmare inducing.